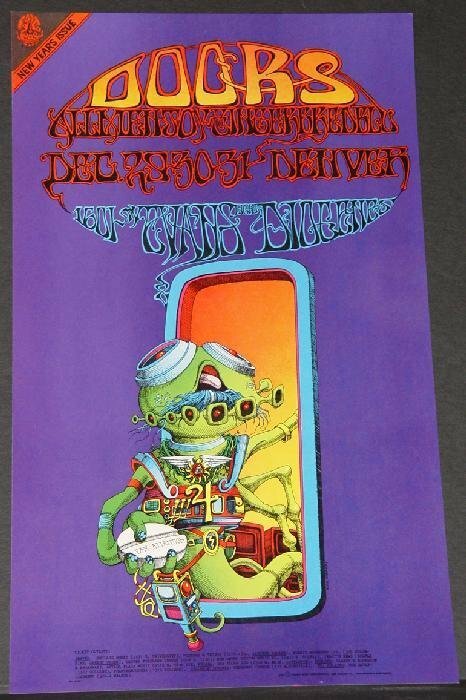 What was your first New Year’s Eve show, and do you still have the poster? Mine was 1970/1971, at the Fillmore West in San Francisco. I was 14, and lived in San Rafael, but my parents thought it would be perfectly fine for me to attend a concert in the city with a couple of friends, and even offered to pick me up after the show. Today, if a parent was caught showing that much trust in the choices of their children, their neighbors would probably call child protective services. In 1970, my choices were the Grateful Dead at Winterland or Cold Blood at Fillmore West. I knew this because I was on Bill Graham’s mailing list. I’m not sure how that happened, but getting those cards every week or so gave me a nice head start on a rock-poster collection later in life. After discussing our options, we decided to see Cold Blood. As I vaguely recall, my friends in San Francisco were open to seeing either concert, but I had just seen the Dead a few months before at the Euphoria (I could ride my bicycle to that venue) on the night when Janis Joplin showed up to sing “Lovelight” and a few other tunes with Pigpen. Even at the time I knew that would be a hard act to top, especially since Janis had died a few months before. I had never seen Cold Blood, and loved their first album with the Rick Griffin lettering on the cover, so we headed to the corner of Market and Van Ness. The room was full but not too crowded, so we had a good view of the Voices of East Harlem, who opened the four-act show, as well as Elvin Bishop and Boz Scaggs, both of whom were absolutely at their prime. The crowd, though, was mostly there to hear Lydia Pense sing “I Just Want To Make Love To You,” and no one went home disappointed. For my young ears, the night was an education, schooling me in the fundamentals of gospel, blues, rock, and R&B. Over the years, my postcard version of BG-263, designed by the great David Singer, became one of my most treasured possessions, which is not to say I treated it kindly, as the photos above and below show. The card was not only thumbtacked to my bedroom wall, it spent a rainy winter, maybe two, thumbtacked to the damp plywood interior (barely…) of a tree fort behind my house. That’s why the thumbtack holes are stained with rust, in case you were wondering. The signature came years later, courtesy of Mr. Singer at a TRPS show. So? What was your first New Year’s Eve, and do you still have the poster? Let us know in the comments below, and have a great 2016! Saw The Doors on New Years Eve 1967/68 at the Family Dog in Denver. They came on around 12:30 a.m. with the light show turned off, opening in semi-dark. I remember When the Music’s Over was performed, but not a whole lot else, other than being completely overwhelmed. I have a poster of that show, but one that I purchased many years later. Don’t recall any NY’s shows – but I sure enjoyed hearing about yours, Ben! How ’bouts 1st Dead shows? I recall that . . .